Start of middle or southern float. Group outing on lower float. 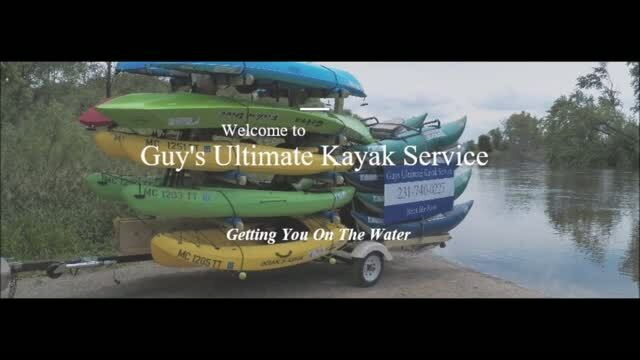 At Guy's Ultimate Kayak Service, I am focused on providing kayak rentals in Muskegon, Michigan, with the highest levels of customer satisfaction & I will do everything I can to meet your expectations. With a variety of offerings to choose from, I'm sure you'll be happy renting from me. My floats begin on the Muskegon river just upstream from the mouth of Muskegon lake. Each float takes from 1, to 1 and 1/2 hours to paddle, but I give you 2 hours to explore the river . One trip ends at the Veteran's Memorial Park, so you can explore the park after your float. You can combine the floats for a 3-4 hour trip. Check out my other pages for all I have to offer and happy floating! Now book floats online 24/7 from my Home page or the Prices page. While in Muskegon (or anywhere) listen to www.Muskegonchannel.com for the best music on the lakeshore. A community based internet station that plays classic and current rock music. Listen on your mobile phone right now. After your float, stop in to Yodels frozen yogurt on Holton road for a cool treat. Make your own creation with the diy topping bar. Check them out at www.YodelsFrozenYogurt.com. Hello, I'm Guy DeBor of Guy's Ultimate Kayak Service. I love the outdoors and water related activities. I have been floating Michigan rivers for 40 years and enjoy relaxing on my River Cats. I have a variety of kayaks, both sit-inside and sit-on-top. All of them are very stable and are great for a stress free float. Renting a kayak is easy and quick so click, call or text 231-740-0227 today, and lets get you on the water. New for 2019: Book a float 24/7 on my website. Just click the book button and reserve your kayaks. Thanks and happy floating! I am a member of the Michigan Association of Paddle Providers. Check out their website.